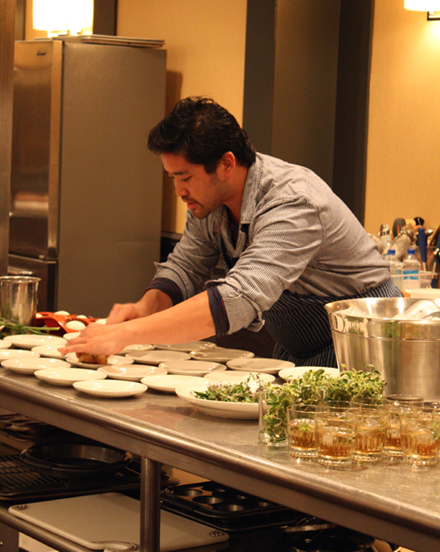 San Francisco’s Bar Agricole has definitely got it going on. The winner of this year’s James Beard Award for “Outstanding Restaurant Design,” this one-year-old, South of Market Street establishment fairly exudes coolness behind a fortress-like redwood fence that fronts a spacious courtyard for eating al fresco, and an herb garden for use by the kitchen and bar. The building’s warehouse-like facade of concrete and corrugated metal gives way to a long, narrow interior. 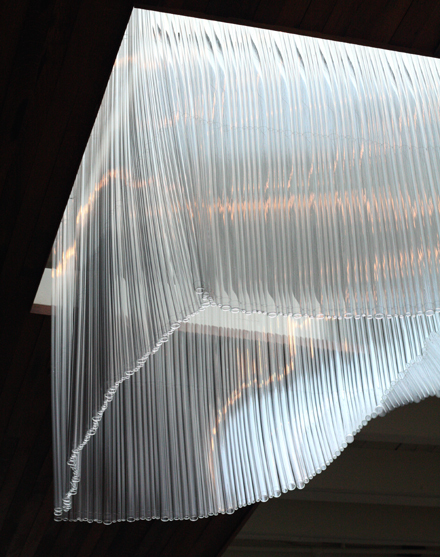 It’s made more inviting by an entire expanse of wall made of reclaimed whiskey barrel oak planks, as well as massive sculptures hanging from the ceiling that look for all the world like swaths of billowing fabric but are really hundreds of glass cylinders fused together. We expected a youthful, hipster crowd when my husband and I were invited to dine as guests of the restaurant recently. But what we didn’t count on were the many middle-aged and beyond diners who also were having a great time over food and drink. Our server explained that was nothing out of the ordinary for this restaurant. Turns out that Generation Xers and Yers rave about the place so much that their parents can’t help but want to check it out, too. How’s that for the ultimate sign of cool? After unfurling denim napkins at our bare wood table, we were all set to order a cocktail. After all, you can’t go to a restaurant that’s named for a type of rum made from freshly-squeezed sugar cane juice and not order a cocktail. Especially when proprietor-mixologist Thad Vogler is so meticulous about the freshness and precision of his cocktails that he also makes five types of ice to keep them cold. 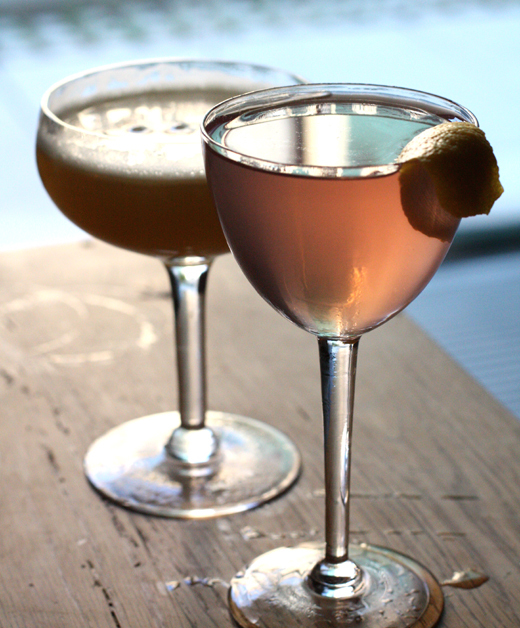 My husband enjoyed the Ti Punch ($10), a blend of white agricole and lime zest with a delicate pink blush to it. I favored the Sleepyhead ($10), a smooth mix of brandy, mint, lime, sparkling wine and plenty of fresh ginger for a finish with a kick of heat. 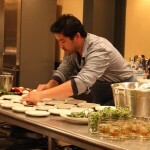 The compact, locavore menu by native San Franciscan, Brandon Jew, changes each night. We shared a starter of marinated local anchovies with a vinegary kick and big, crisp garlic chips that were worth fighting over. 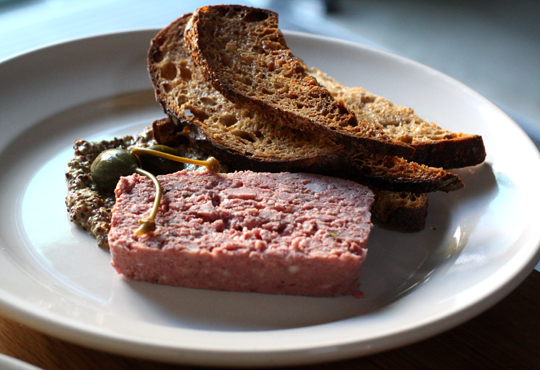 Next, a country-style pork pate ($10) with a rustic texture — perfect for spreading on crunchy slabs of grilled bread with grainy mustard and piquant caper berries. 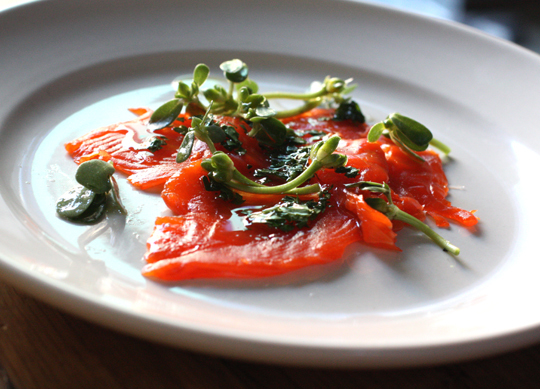 A vibrant orange sockeye salmon gravlax ($9) was as silky as it gets. 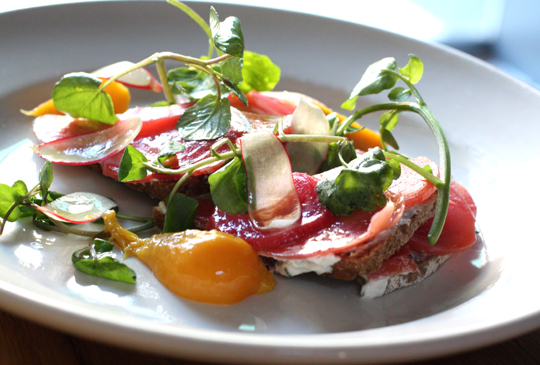 Caramelized slices of roasted beets were piled atop rye bread smeared with horseradish cream ($8) for a can’t-miss taste of sweet and fiery. My husband’s entree of rabbit saddle ($32) was super succulent. 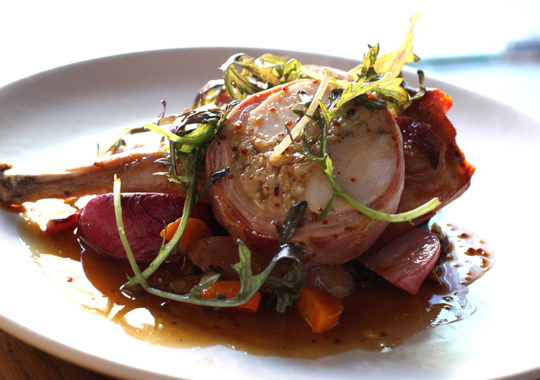 It’s how you wish supermarket pork loin could be. The leg, alongside, was fried. Porcini, scarlet turnips and mustard greens completed this plate that tasted of the forest. 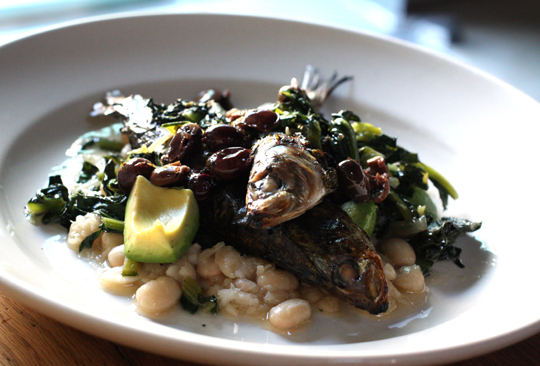 My grilled sardines ($20), which had been cooked in grape leaves, arrived whole and made for messy eating. But it was worth picking through all the tiny bones to enjoy the smoky, rich flesh that lay atop a bed of white beans, avocado and olives. 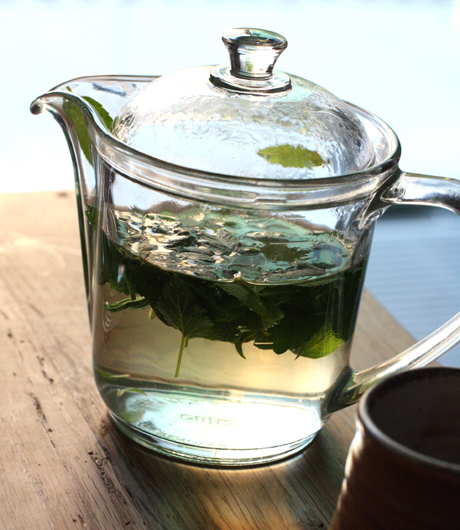 To clear the palate, our server brought over a soothing pot of herbal tisane ($4), in which steeped lemon verbena, lemon balm, and mint — all grown on the premises. I can never pass up a crepe cake when I spot it on the menu. This rather regal version ($9) was gilded with cherries and hazelnuts. It was delightfully eggy and custardy with noticeable vanilla flavor. The bruleed top was a nice touch, as was the fact that this towering stack was made up of 35 crepes. Yes, even our server was curious as to the exact number, so she went back to the kitchen to ask and was in awe as much as we were upon hearing the answer. 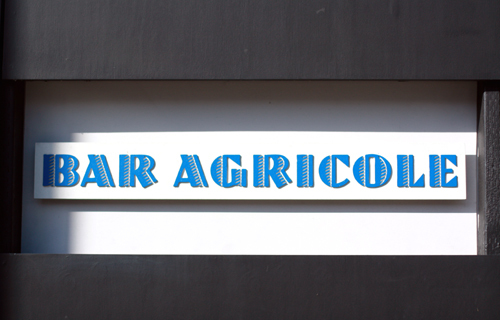 After all, Bar Agricole aims to please — in the coolest manner possible. Lovely food! I really love the dessert. 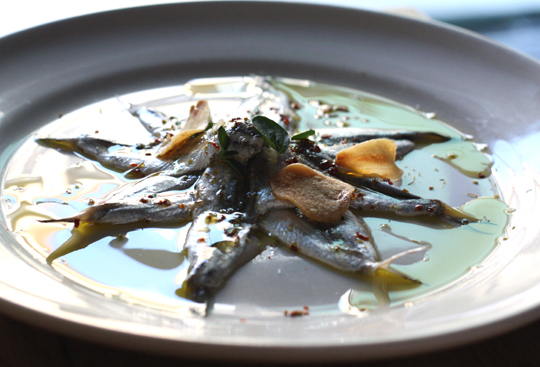 I’ve never been a big anchovy fan, but “marinated local” are definitely appealing. 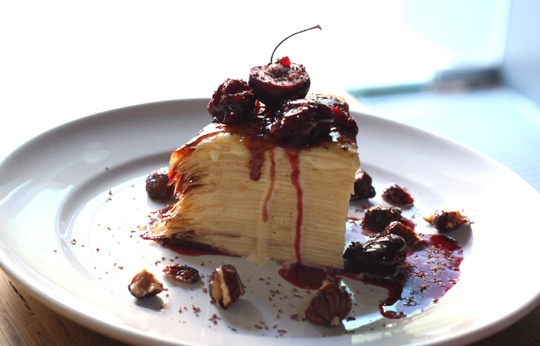 And ohmygosh … crepe cake!!!!! You’re right, this place has got it. I’m not a fish fan, but the rabbit and the crepe cake are enough to draw me to this place. How early(late) can one make reservation to know for sure if they would have crepe cake that day? Awesome review! Sounds like a great place…hipster but not TOO much. wow! what a fun place! I’m drooling over that dessert! Mai: According to Bar Agicole’s co-proprietor, Thad Vogler, your best bet is to call the restaurant the day before to see if the crepe cake will be on the menu the next day. You can also check the online menu the day you plan on going. Or best yet, go for brunch, as the crepe cake is usually on the menu then. Tami: The crepe cake at Cafe des Amis in San Francisco is also great. It’s a little different — shorter and with more cream in between the crepes, so that the crepes soften and almost become one with the filling. Bar Agricole’s has more height and the crepes keep their texture more. SkinnyGirl: I was over the moon to spy a cocktail with ginger — and especially one in which you could actually taste the real heat of the ginger. Too many ginger cocktails are overly sweetened, deadening the lovely bite of the ginger. Not this one. where did you get the pictures from? I’ve been there a couple of times now and had almost all the same dishes but our portions were much much smaller. Interesting that the ones in the picture were much bigger. Did they know you were a blogger and a reviewer? oh I re-read your review and see that it was ALL paid for by the restaurant. no wonder it’s so glowing and the portions are so huge. Gen X & Yers have a lot of disposable income but I sometimes wonder about whether they have the equivalent tastebuds though some are quite discerning. I would order that pork pate with the rustic bread and caperberries in an instant. Delicious dinner! The crepe cake looks amazing! I have some leftover roasted beets and will make that course for lunch tomorrow, yum.